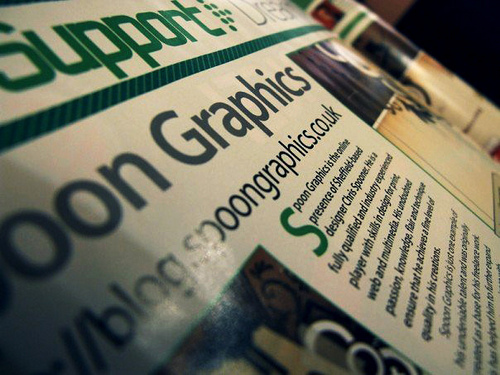 Long time subscribers may remember a post from a while back; Six Months of Blog.SpoonGraphics. I thought it would be fitting one year from the start of the blog to present a few more stats and snippets of information, plus, ask you the readers what you would like to see on the site in the future! I’m still really impressed over how the site has grown over the past year, it’s helped tremendously in my personal learning curve of online marketing, social media and general website optimisation and upkeep. With regards to traffic sources the main source of vistors has been StumbleUpon, with Good-Tutorials also bringing in plenty of traffic to my tutorials. I also had the pleasure of making the Delicious popular pages in March but strangely enough I’ve never had any success with Digg! Double page cover of Blog.SpoonGraphics in the Dreamweaver section, “diagnosing the tricks behind the dot com designs” with an overview of the key design features of the site. After being kindly informed by email of a high ranking in the Alexa stats for my home county I recently checked back to find I had subsequently made it to first place spot. Now would be the pefect opportunity to discover what the readers of the blog would like to see in the future in the form of articles, tutorials and freebies. I’ve been struggling to come up with new content recently so this will really help out! Post your thoughts in the comments and I’ll have a go at implementing a post around your topic! Well done. Your accolades are richly deserved. i started subscribing about a year ago. The tutorials on yours and others blogs was what taught me Adobe’s programs. By far the most helpful posts for me currently are the “inspiration” posts where you highlight artists and things that i have not heard of and can maybe learn something from. Congrats! Can’t wait for another year. I still can’t believe it’s been a year already! Congrats Chris! I don’t remember not liking any article posted here in SG, but if I have to suggest something, I’d say a little more web-design oriented tutorials. Any chance you could do a tutorial on vector art, but in te the style of those airplane safety cards? I’ve seen a few spoofs and they look great. Problem is, im not too sure when to draw the line with detail when it comes to vector! Congratulations on the success of your blog. Richly deserved! A couple of tutorials on web design is a good idea, I’ve always assumed more concise articles could be found elsewhere on the web but I’ll definitely see what I can come up with! Also, the idea on the airplance safety vector style art is superb, that’s one project I could have a lot of fun with! Congrats and well done… it was well deserved. The only way from here is up! Congratulations Chris! You deserve it. It shows that you really put a lot of work into having a great site. I have been a fan of yours since the beginning. I always enjoy your work. I also hope to continue to see your freebies. You got to love those! The articles are also really good. I like your posts of “great pieces”. We don’t always have time to check out all the neatest work and artists, and what’s going on in the scene. I’m going to buy you a drink right now! This blog is so well-made and original, that made ME understand something aboud web designing and graphics. Thanks really much for your exellent tutorials and for sharing freebies. Keep up the good work! Your blog is full of useful stuff, your own reputation is deserved. You’re well worthy of what you’ve achieved, Chris. Your work is excellent, and your tutorials are extremely beneficial. i discovered spoongraphics right now. cool postings on your site. i will add your blog to my faves. Awesome! I really love your tutorials. You break things down into a way that is easy to follow and understand. How about some posts on your inspiration, too? And how do you apply those inspirations to a project? Or walk us through some of your design projects (the creative process before the computer). Great job on surpassing the year mark, and you’ve definitely come a long way! I’ve not been following as much as I will from now on, and you have a new subscriber in me.